Midnight is in for the long haul. He’s sitting in his big rig, clocking the miles. He’s got work to do. He’s a trucker cat. Ann Dziemianowicz, author of this blog and Careers for Your Cat is happy to chat with Midnight. Your job as a trucker cat is very unusual. What do you do? I work for a large moving company. I ride in a big Kenworth truck and travel all over delivering furniture. Naturally I supervise, while my humans work. The Big One drives and co-pilot “Mommy” handles the paper work and the driver logs. They also load the furniture. I keep an eye on everything. Keeping guard is one of my duties. What kind of personality does a trucker cat need? Recently my people and I went to Maryland to make deliveries. The Big One got very frustrated with the help so I got him all calmed down when he got in the truck. Once in awhile, I’m called on to greet the customers (cat-lovers, mostly). Sometimes they even give me treats! Sounds like you’re very easy-going. Midnight supervises in the truck. What’s it like for you in the truck? There is a place for my litter box, there are cubby holes for me to sleep in, I can climb and play in the luggage. And my own food and dish accompany me in the truck. I always have plenty of food and water. I favor Healthful Life by Purina and Fancy Feast (Turkey) but the Fancy Feast is for home only. On the road I get a moist bags of Friskies or Whiskas. I prefer meats and poultry flavors over fish. And I love to drink my water straight from the tap. At night where do you sleep when you’re on the road? How did you come to adopt your humans? You’re quite a handsome fellow. Did they just fall in love with you? Ah, yes! My humans. They “rescued” me from a cage at the Teterboro Animal Shelter in Teterboro, NJ. It was magic! Or rather a tape measure that drew us together. The Big One started waving this thing in front of me and they both looked like they wanted to play. I was instantly attracted to this “toy” and after much human fussing and silly noises from them, the next think I knew, I was put in a box and whisked away in a large gray truck. They took me to their home where I met the Big One’s mother (or Grandma to me). I was born sometime in May 2009 or about 15-17 years in cat time. My humans gave me an official birthday of January 8th when they adopted me. How did you get started in the trucking business? My humans decided to take me along because Grandma could not care for me. I was not afraid and they seemed to get a big kick out of us being together on the road. I learned quick enough not to go near the shifter or the pedals--but there is plenty of space inside the truck to play. We all live in an RV, our home, in Jackson, NJ. We are here when work is slow. Grandma had to go to a nursing home so I visit her. She is always happy to see me. And so is everyone else there too. I clean my whiskers and put on my best performance for them. I learned how to take apart a remote control. Batteries make excellent toys - they roll and make a lot of noise. I’m purr-fectly content to sleep on the back of chairs, eat and watch the birds. I see on your Facebook Page that you are single and looking for friendship. Have you met any other cats on your road trips? Yes, I met a beautiful white cat in Daytona, Florida. I only saw her through the window but, oh! What a looker! We were meowing and singing songs of unrequited love to each other! My Florida kitty is a hotel/woods kitty. The hotel people take care of her and others outside. I wish we could take her home! Midnight with his lady love. I am trying to figure out what this Christmas thing is all about. 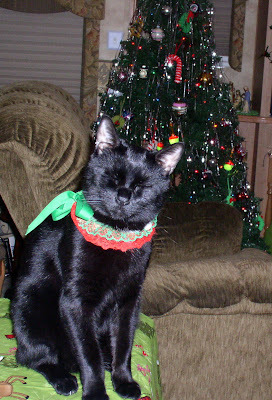 It is actually my 2nd Christmas but I was in a cage at the shelter then. There was not a big fuss like what’s being made now for this Christmas. There is a tree INSIDE our home and there are all kinds of glittery things hanging from it. I don’t get it. And Mommy keeps putting strange collars with ribbons and bows on ME! Midnight all decked out for the holidays. A big thanks to Midnight’s humans (Mommy and The Big One)!! And of course to Midnight! 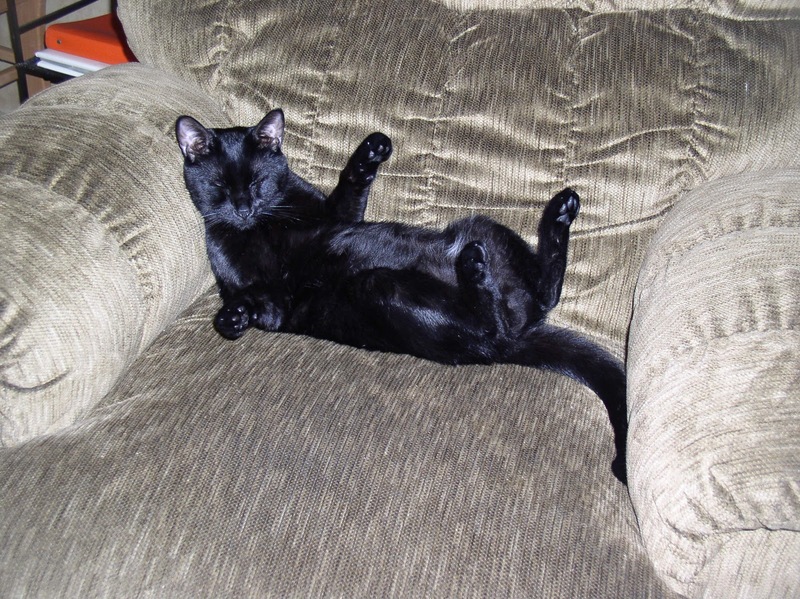 If you enjoyed this story, you''ll like Funniest Cat on Twitter Shares Secrets to a Good Life. Great interview, and I love the accompanying pics! Yay Midnight! Midnight, you are a handsome fellow, and so lucky you found humans to take such good care of you! You would have enjoyed our black and white kitty, Twister, too. She got to travel all over the U.S., all 4 "corners." But that was before her dad became a trucker, and before she went to the Rainbow Bridge. Some cats love to travel! What a wonderful interview! Midnight has quite an adventurous life. I am glad that he enjoys it so much. Midnight gave an excellent interview about his Long Haul travels. He has the makings of a real "Pet Star" and should be on TV and be featured in newspapers. 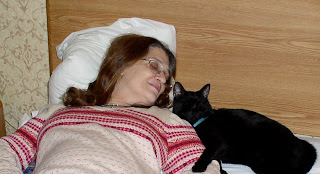 Ann, thank you for putting together this wonderful story and interview about Midnight the Trucker Cat! I'm posting your blog and this story on my Facebook Page for everyone to read. 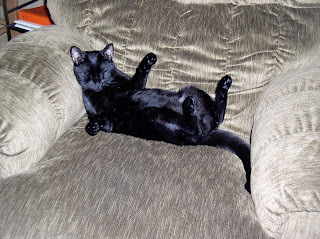 Midnight really enjoys his life like a human being. Pictures depict that all his actions are like a mischievous boy. I feel pleasure for his audacious life. Thank you Catsparella! 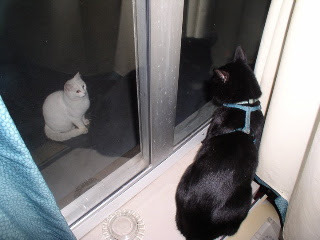 I love the pix of Midnight supervising! DrBert: It sounds like Twister was quite the traveller too! So sorry she went to the Rainbow Bridge. Thank you for your kind words about the interview! Karen Jo: Yes, Midnight is quite the adventurer! More travelled in US than me! thercattrainer: Aww, thank you for sharing this post and for your nice words about the interview. Yes, Midnight has the makings of a real Pet Star! Alvin: Yes Midnight is really living his life to the fullest! We can all learn from him. great interview! Midnight sounds like a very cool and very lucky kitty. Travelling kitties always impress us cause, well, we're not! Hi Cara n Crew: Thank you for the nice compliments. Thanks for visiting me Pip, Smidgen, Minnie and Hollie too! You can be armchair travelers! Purrfect for kitties who don't want to leave the home! Hi, Ann and Midnight. Nice to see another travelling kittie. We're stay at home kitties ourselves, but we've been following Truckin' Buster for a while. 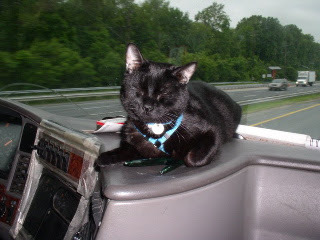 He spends most of his time in a Freightliner, with his pet human, Matt.